A history-making day for trainer Bob Baffert and jockey Mike Smith continues on Saturday's blockbuster card at Belmont Park, as the two Hall of Famers teamed up on Michael Lund Peterson's Mor Spirit to bring home the G1 Mohegan Sun Metropolitan Handicap. A 4-year-old son of Eskendereya, Mor Spirit dominated his 11 rivals over the one-turn dirt mile, crossing the wire 6 1/4 lengths in front of Sharp Azteca to stop the clock in 1:33.71. 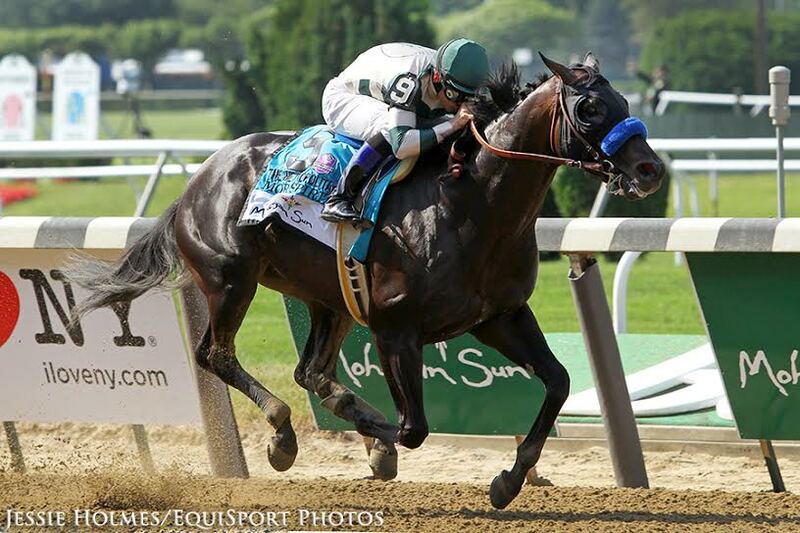 Mor Spirit's win earned him an all expenses paid berth in the Breeders' Cup Dirt Mile. Smith and Baffert also teamed to win the listed Easy Goer Stakes with West Coast, the G1 Acorn with Abel Tasman, and G2 Woody Stephens with American Anthem. Smith added a victory aboard Songbird in the G1 Ogden Phipps to bring his total to five victories over the nine races held at Belmont thus far. From the get-go it was Sharp Azteca and Mor Spirit a half-length apart in front of the field, with Smith sitting chilly tracking his rival in second on the outside. Rally Cry and Virtual Machine tracked the pace as Mohaymen and Tom's Ready were in good stalking position behind those. Smith kept the pressure tight on Sharp Azteca, who was making his first start since performing extremely well (despite a questionable ride) to finish third in Dubai's Godolphin Mile. After fractions of :23.20 and :46.05, Smith rode Mor Spirit up to draw even with the leader. Suddenly the race was over, as Mor Spirit just bounded away from Sharp Azteca in the far turn to draw away to a two-length advantage at the top of the stretch. Smith hand-rode the colt to the wire, 6 1/4 lengths in front of a still-game Sharp Azteca in second. Tommy Macho got up to finish third, and Awesome Slew was fourth. Bred in Pennsylvania by the Elkstone Group, Mor Spirit was an $85,000 yearling purchase at the Fasig-Tipton Kentucky Fall Sale. He then brought $650,000 at the Fasig-Tipton 2-year-old select sale, purchased by Peterson. The colt rewarded his owner with a juvenile win in the G1 Los Alamitos Futurity, then was on the Kentucky Derby trail in 2016. After finishing second in the Santa Anita Derby, Mor Spirit was 10th in the Run for the Roses itself, then had a seven-month layoff. After kicking off 2017 with a second in the G2 San Antonio Stakes, Mor Spirit won his next three starts, including the Essex Handicap and G3 Steve Sexton Mile at Lone Star Park before his Met Mile triumph. Overall, Mor Spirit boasts a record of six wins and five seconds from 13 starts, with earnings of over $1.7 million. This entry was posted in NL List, Racing and tagged awesome slew, belmont, belmont park, belmont stakes racing festival, Bob Baffert, Met Mile, Metropolitan Handicap, Metropolitan Mile, mike smith, mohaymen, mohegan sun, mohegan sun metropolitan mile, mor spirit, sharp azteca by Paulick Report Staff. Bookmark the permalink.